featured in Atlanta Homes & Lifestyles. Architect William B. Litchfield and Jackye Lanham designed this stunning space, replete with southern charm. 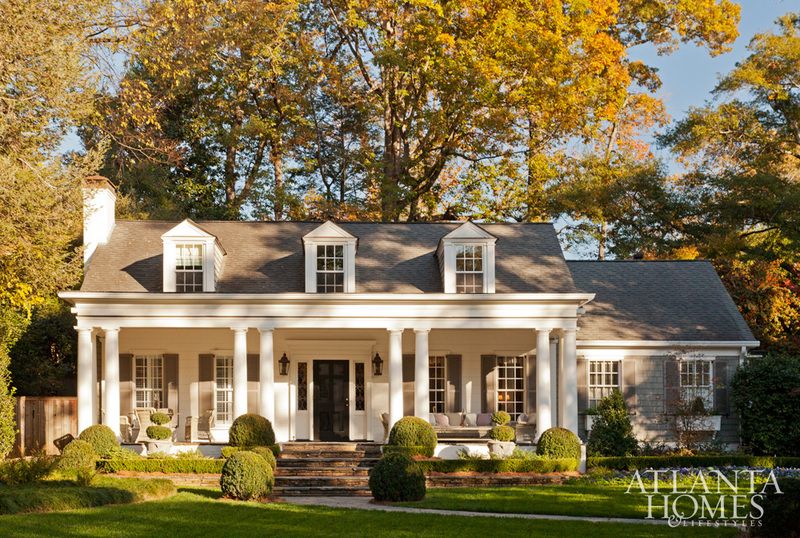 Classic finishes lend this home tons of personality. Cozy spaces with plenty of light give this cottage a distinctively homey feel, perfect for curling up and relaxing. A mix of old and new lend a collected, finished feel to each of the homes stunning spaces. Touches of wood add depth to the bright white renovation of this sparkling kitchen. Grass cloth in a light shade is cozy and just a tiny bit reminiscent of the coast. One of our favorite parts of this redesign is that the spaces flow together effortlessly without being so open as to feel cavernous. Three dimensional art always adds a unique flair. Architectural details take center stage in this home. The continuity of furniture colors and styles from one room to the next lends soothing appeal. Chic finishes and a spa like tub make this master bathroom an oasis. Simple and clean, this is an enviable vanity. A sweet window seat makes this bedroom feel even cozier. Unexpected angles and classic prints and fabrics add to the cottage feel of this stunning home. We hope you enjoyed touring this one as much as we did. Thanks so much for making Design Chic a part of your day! We always love seeing you here! Good morning, sweet readers! It is a beautiful, glorious day for a house tour. Speaking of, the Beaufort house is getting ready to be on tour! We always think that parties are a great thing because they make us get things done, finish up little projects, deep clean the pantry… Everything, really. A beautiful bathroom is one of our favorite luxuries. A beautiful bathroom with an incredible freestanding tub is almost too good to talk about! We have had the most fun day with our fabulous friend Laura Trevey (we know you know her from Bright, Bold & Beautiful and her fabulous art!) and our new buddies at Lowe’s, who teamed up to give us the most incredible Christmas makeover! We can’t wait to share more about it and the amazing photos snapped by the talented Smith Hardy… As soon as we get them! The bestselling author of several interior design books including our favorites French Impressions and The French Way With Design, the adorable Emily series of children’s books and a variety of Christmas volumes, this multi-talented designer creates enduring looks that are undeniably show stopping.